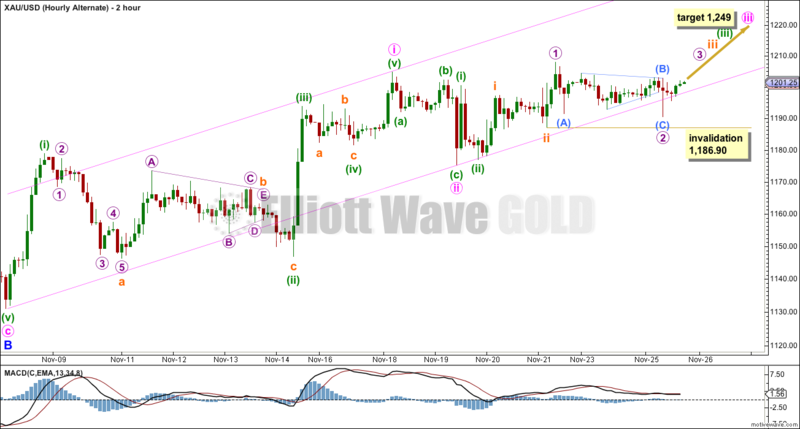 More upwards movement continued to start the new week as the main Elliott wave count expected. Gold is still range bound. Classic analysis, with a heavy reliance on volume analysis, is used to determine probability of the main versus alternate Elliott wave counts today. Yesterday’s Elliott wave and classic technical analysis expected some sideways / upwards movement for Thursday, which is exactly what happened. Price has found resistance right at the trend line on the daily chart. More downwards movement is very close now to the second target, which was at 1,240. The first target for downwards movement has been met. Again, price moved overall sideways to complete a very small daily Gravestone doji. 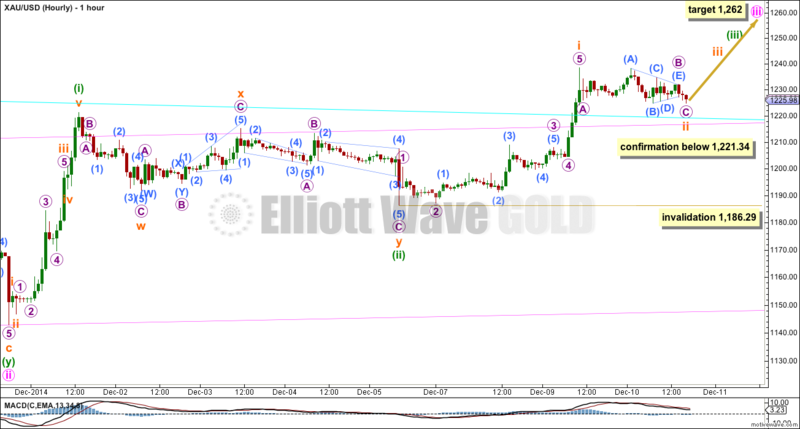 The main Elliott wave count from last analysis expected price to move higher, which is what has happened. Last analysis expected a counter trend movement to continue. A long legged doji candlestick fits this description. Price moved lower as expected. A small candlestick, which may end as a doji for Thursday’s session, fits the Elliott wave count nicely. A little more downwards movement takes this move into its fifth day. I am swapping the Elliott wave counts over. 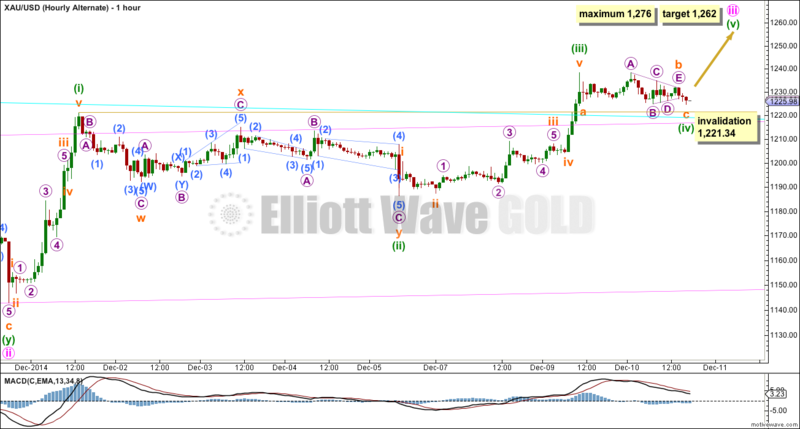 Yesterday’s alternate is now the main preferred wave count. This is in line with GDX and Silver. 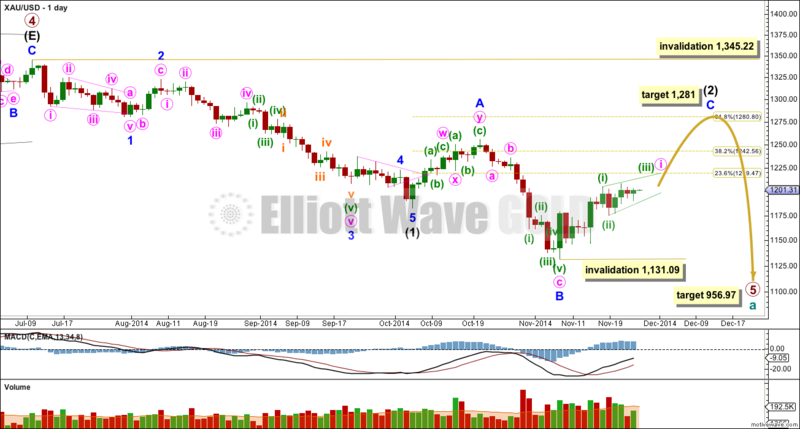 A small red candlestick on the daily Elliott wave chart changes the wave count at the hourly chart level. The overall mid term target remains the same, and the trend is still upwards. Summary: This sideways movement is most likely very close to completion. Overall the trend remains up. When sideways movement is done the next move from Gold should be up and is likely to show a clear strong increase in upwards momentum. The mid term target at 1,262 remains the same. Intermediate wave (2) is an incomplete expanded flat correction. Within it minor wave A is a double zigzag. The downwards wave labelled minor wave B has a corrective count of seven and subdivides perfectly as a zigzag. Minor wave B is a 172% correction of minor wave A. This is longer than the maximum common length for a B wave within a flat correction at 138%, but within the allowable range of twice the length of minor wave A. Minor wave C may not exhibit a Fibonacci ratio to minor wave A, and I think the target for it to end would best be calculated at minute degree. At this stage I would expect intermediate wave (2) to end close to the 0.618 Fibonacci ratio of intermediate wave (1) just below 1,281. Intermediate wave (1) lasted a Fibonacci 13 weeks. If intermediate wave (2) exhibits a Fibonacci duration it may be 13 weeks to be even with intermediate wave (1). Intermediate wave (2) has just begun its ninth week, and so it may continue now for another five weeks in total. So far within minor wave C the highest volume is on an up day. This supports the idea that at this stage the trend is up. The upper maroon trend line is the upper edge of the Elliott channel drawn about this impulse on the weekly chart, and copied over here to the daily chart. See the most recent Gold Historic Analysis to see how this trend line is drawn on the weekly chart. If minor wave C lasts long enough it should find extremely strong resistance at that trend line, I would not expect that trend line to be broken while primary wave 5 is incomplete. The aqua blue trend line is a simple TA trend line which is showing where price is currently finding resistance. The power of the middle of the upcoming third wave should break above this trend line. If this trend line begins to be breached that may be the earliest indication that the main hourly wave count is correct today. I am copying this trend line over to the main hourly wave count today. My labelling of the structure of minuette wave (iii) yesterday was wrong. Because current sideways movement shows clearly on the daily chart this is not micro wave 4, and may be a second wave correction within minuette wave (iii). Only subminuette wave i within the middle of the third wave may be complete. This would expect that minuette wave (iii) would be extending. It is very common, extremely common, for third waves to extend. When they do their subdivisions often show up nice and clear on the daily chart. So it is entirely possible that subminuette wave ii is showing on the daily chart. If price moves below 1,221.34 then this would be my only hourly wave count. However, it may be that the upper edge of the pink base channel about minute waves i and ii (copied over to hourly charts from the daily chart) is strong enough to provide support to downwards movement, and force this current correction to be very shallow. I would judge this main hourly wave count to have a greater probability, maybe about 60% today, because it expects to see the most likely situation of an extending third wave with stronger momentum than the first wave. Subminuette wave ii may not move below the start of subminuette wave i at 1,186.29. When subminuette wave ii is complete then the next movement for Gold should be a third wave of a third wave of a third wave. It should show a clear strong increase in upwards momentum. Minute wave iii would reach 1.618 the length of minute wave i at 1,262. This target still remains the same. The structure and subdivisions are seen for both hourly wave counts in exactly the same way, only the degree of labelling for the most recent movement is different. This wave count simply moves the degree of labelling within minuette wave (iii) all up one degree. What if it is over and this sideways movement is minuette wave (iv)? 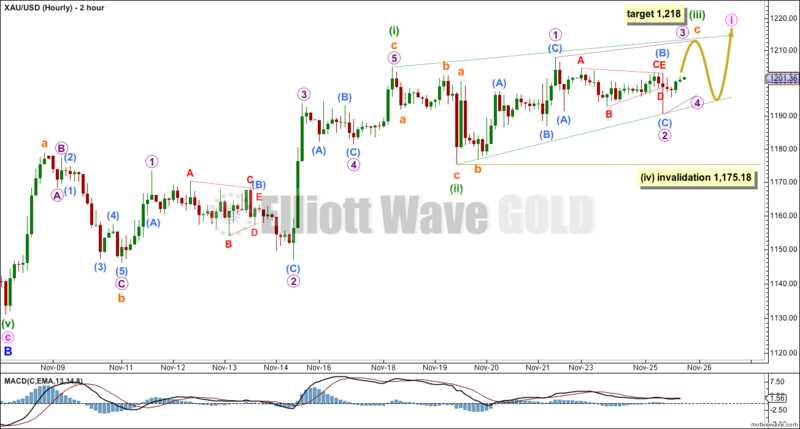 If minuette wave (iii) is over and this sideways movement is minuette wave (iv) then it must be a very shallow correction so that it does not move back down into minuette wave (i) price territory below 1,221.34. If this price point is breached this alternate wave count will be invalidated and the main count will be correct. If minuette wave (iv) is unfolding as a zigzag then it shows some alternation with the double zigzag of minuette wave (ii), but both are of the zigzag family and both are shallow corrections. The alternation is inadequate, which points to the main wave count being more likely. I would judge this alternate to have about a 40% probability at best. If minuette wave (iii) is over then it did not manage to have stronger upwards momentum than minuette wave (i). Sometimes third waves are not stronger than first waves, but this is unusual. This also reduces the probability of this alternate wave count today. If minuette wave (iii) is over then it was 3.60 longer than 0.618 the length of minuette wave (i). This limits minuette wave (v) to no longer than equality in length with minuette wave (iii) at 1,276. Minute wave iii would reach 1.618 the length of minute wave i at 1,262. This target still remains the same for both wave counts. The mid term expectation is exactly the same. This analysis is published about 06:04 p.m. EST. Price has moved mostly sideways to complete a small red candlestick. 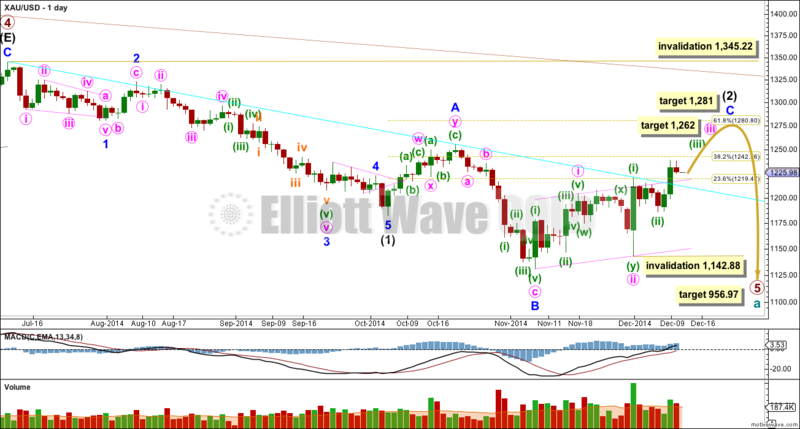 The main and new alternate Elliott wave counts both remain valid.